When you make use of a navigation system, the GPS coordinates of campsites are almost indispensable. That’s why the GPS coordinates of every campsite are included in the CampingCard ACSI guide, these coordinates can also be downloaded free from the CampingCard website. Our inspectors have recorded the coordinates at the campsite entrance, so there’s almost nothing that can go wrong! You can easily make use of the Google route planner on the CampingCard website. And for those who still like to use the nostalgic route book we include a description of the last few kilometres to the campsite. That’s useful, as not all campsites are on a main road. The GPS coordinates will then be downloaded automatically onto your computer. To transfer them onto your navigation system you should consult the operating instructions for your navigation system. Take note! ACSI does not offer any (telephone) support for operating your navigation system. Consult the operating instructions for your navigation system (TomTom, Garmin, Snooper) for the exact procedure. If you have any questions or experience any problems regarding the implementation, we advise you to contact the manufacturer of your navigation system. The GPS coordinates are displayed in degrees, minutes and seconds in both the guide and on the website. You can enter the coordinates manually into your navigation system. Check to make sure that your navigation system is also calibrated in degrees, minutes and seconds. There will be an N in front of the first number. There will be an E or W in front of the second number. Not all navigation systems are calibrated for a car-caravan combination. That’s why you will always find in the guide and on the website a route description of the last few kilometres to the campsite. Don’t forget to watch out for the signs. For the shortest route is not always the easiest route! 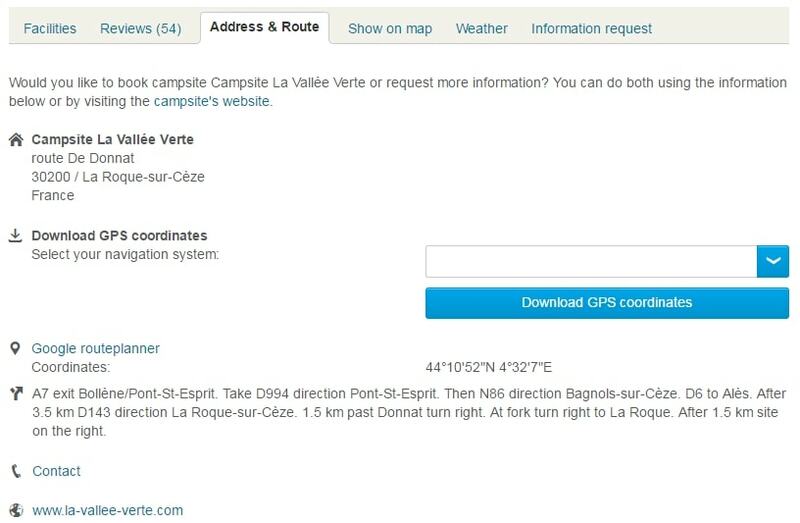 Using the ‘contact details’ tab on the website you can also plan your route to every campsite using Google Route planner. Click on the link and fill in your departure point.